Argentina is an economic basket case. It is that simple. The country never seems to be able to emerge from its problems. The key reason is that the country is extremely weak constitutionally and institutionally and as a result the country has some of the worst policy makers in Latin America (if not in the world). Argentina’s government pledged that a new system of price controls introduced today won’t lead to the shortages that have crippled other countries’ attempts to enforce cost-cuts for consumers. The government will use computer software to monitor prices on 194 products in the Greater Buenos Aires area, Commerce Secretary Augusto Costa said today in a press conference. The “voluntary” agreement comprises 10 supermarket chains and 65 suppliers and will incorporate other regions of the country during January, Costa said. The accord follows a similar agreement in June when the government froze the price of 500 goods on supermarket shelves in a bid to rein in the region’s second-fastest inflation. Government and consumer vigilance along with fines and the threat of closure will stop supermarkets from reducing stocks and creating shortages, Costa said. About 1 in 5 products can’t be found on supermarket shelves in Venezuela where more than 100 products are price controlled. 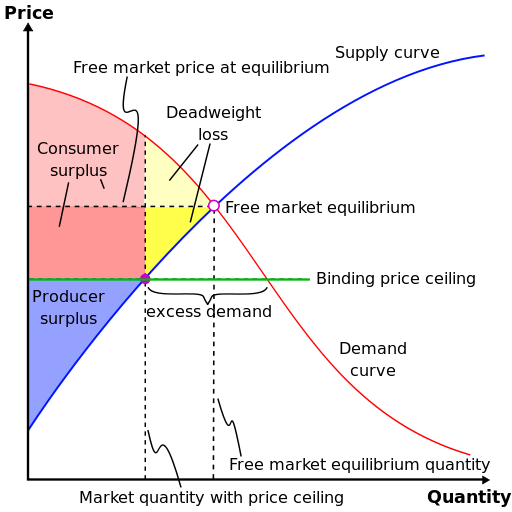 I sometimes get the impression that nobody in Argentina studied any economics (I know good Argentine economists so I know that that is not true) so maybe we should help the policy makers with a simple graph that explains what happens when you introduce price controls (a price ceiling). See here.